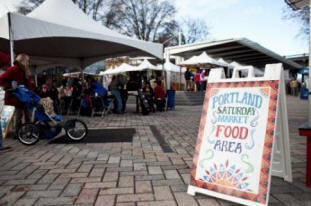 Portland is a city that thrives on its arts and culture scene and nothing shows off that scene better than the Portland Saturday Market. The market attracts over 750,000 people each year and for good reason: From great food to all kinds of art in all shapes and sizes, it has something for everyone. The market was founded in 1974 and since has become one of the largest outdoor arts and crafts markets in the nation. Over 350 small business and local artists show off their goods each weekend at the market from March through Christmas. On Saturdays from 10 am-5 pm and on Sundays from 11 am- 4:30 pm, patrons can expect to enjoy live music, local and exotic cuisine and of course, fine art in almost any form. The location, in Old Town at the North Waterfront Park and Ankeny Plaza, is ideal for public commuting. It is accessible by the TriMet MAX Light Rail as well as by bicycle and by foot. Drivers can also receive free parking which is available at any Smart Park location with a $25 dollar purchase at the market. Best of all, admission to the market is free for everyone. The market is not only great for art collectors, but an important way for the artists and artisans to showcase their work. Everything sold at the weekly event must be handmade, which makes it an exclusive opportunity for individual artists to display their talents and build their reputation with the public. Artists also get the chance to meet and greet collectors and art lovers to discuss the culture and history behind each unique piece. Walking and shopping for fine local art should work up an appetite that surely can be satisfied at one of the many food booths at the Saturday Market. You can find whatever your heart and your palette desire, from a fresh and filling omelet at the Firebird Café booth to snacking on some of Cool City’s Kettle Corn. If your taste buds are searching for something more exotic, one can enjoy Greek, African, Lebanese and other ethnic cuisine. This year the market turns 38 years old, but certainly isn’t slowing down. Its first weekend of the season, place on March 5th and 6th, featured more than 200 artists and over 20 food booths as well as live music by The Fenbi International Superstars, The Cardboard Songsters and others. The season kickoff also included gift card and gift basket giveaways throughout each of its two days and should be only a small sample of what’s to come for the rest of the year at the Portland Saturday Market. Whether you are a family or a single looking to shop and mingle, the market offers a full day of fun, food, music and art. If the 38th season of the event follows the past 37, it won’t disappoint the growing number of supporters and visitors who have helped make it what it is today.